Vancouver studio Dear Human has come up with a brilliant idea that will turn your wall into a giant canvas primed for creativity. 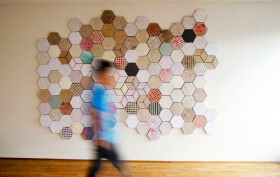 Aptly called “Wallpapering,” this cool system consists of interlocking hexagonal tiles handcrafted from recycled paper that can be arranged and rearranged into an array of patterns. Each tile is hard as board, light as cork and can easily be painted to create a beautiful and personalized mosaic that will dress up any space.